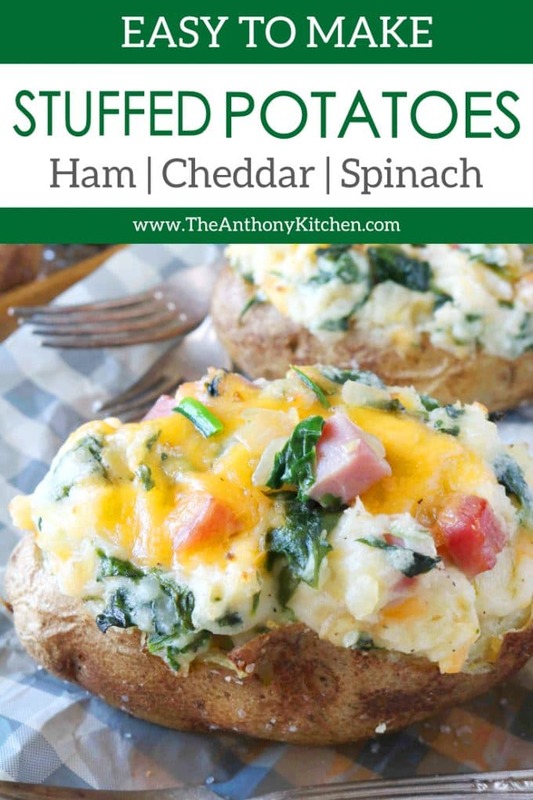 A stuffed potato recipe featuring cubed ham, spinach, and cheddar cheese. My mind was running like a carousel all last week as I was brainstorming ways for us to put that leftover Easter ham to good use. I couldn’t help, but stop the reel at stuffed potatoes every, single time. 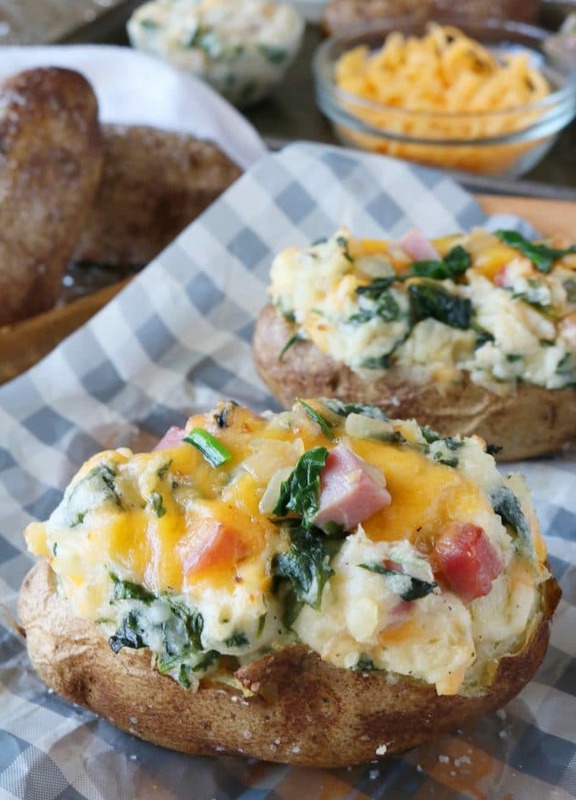 You see, I had this vision of a giant, creamy potatoes, bursting with golden cheddar cheese, cubes of salty, briney ham and pretty little speckles of earthy, dark green spinach. Soon after, I got to work roasting my Russet potatoes and not only did this recipe prove to be all the deliciousness I myself had hoped for and more, but my kids gobbled it up too. Like, devoured it…even ate the skin. Now, that’s a proud mom moment right there. 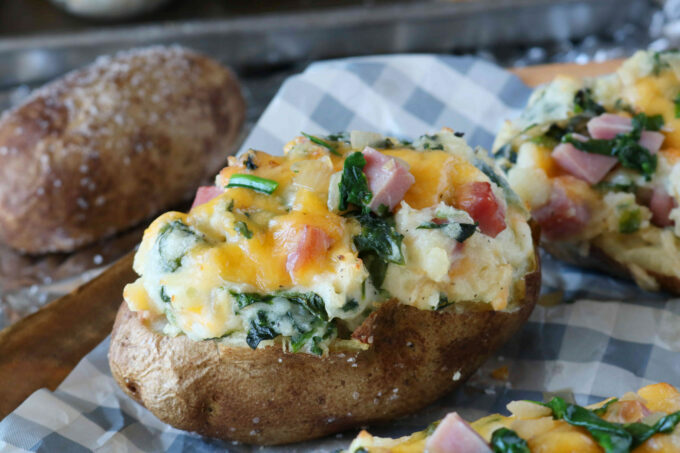 Irish Nachos are where potato skins and nachos collide and the aftermath is seriously delicious. They feature crispy roasted potato rounds, a melty Cheddar sauce, crispy bacon, sliced green onions, and sour cream. Garlic-Parmesan Smashed Potatoes feature baby gold potatoes (or red potatoes) smashed and smeared with a garlic-Parmesan butter, then roasted to crispy perfection. 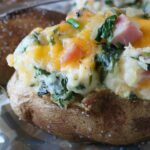 Twice-Baked Potatoes with Havarti and Dill features a new take on twice-baked potatoes, with big flavor thanks to Havarti and Dill. Creamy Scalloped Potatoes with Cheese feature sliced Russet potatoes, Gouda Cheese, and Gruyere Cheese. The perfect addition to any family-style or holiday meal! Preheat the oven to 400° and have ready a rimmed baking sheet, lined with aluminum foil. Place potatoes on baking sheet, drizzle the potatoes with 2 teaspoons of Canola oil and sprinkle with 2 1/2 teaspoons of Kosher salt. Rub all over to adhere and bake for 1 hour and 15 minutes, or until the flesh is fork tender. Set aside 10-15 minutes, until cool enough to handle. Reduce the oven temperature to 350°. In the meantime, add a tablespoon of Canola oil to a large saute pan over medium heat. Saute onion, about 5-7 minutes or until softened. Add garlic and saute 1 minute, just until fragrant. Add 1 tablespoon of water to the saute pan. Add the spinach to the saute pan one handful at time, stir until wilted, followed by another handful. Repeat this process until all of the spinach is wilted. Transfer the mixture to a colander and using the back of a wooden spoon, press as much moisture as possible out of the spinach mixture and allow to cool slightly. Transfer to a cutting board and chop the mixture. Set aside until ready to use. Cutting lengthwise with a sharp, serrated knife, cut about a 1/3 off the top of the potato. Carefully, scoop the flesh from both the top and base of the potato and transfer to a large mixing bowl. Add butter, cream cheese, half and half, 1 teaspoon Kosher salt and black pepper to the potatoes, and stir to thoroughly combine. 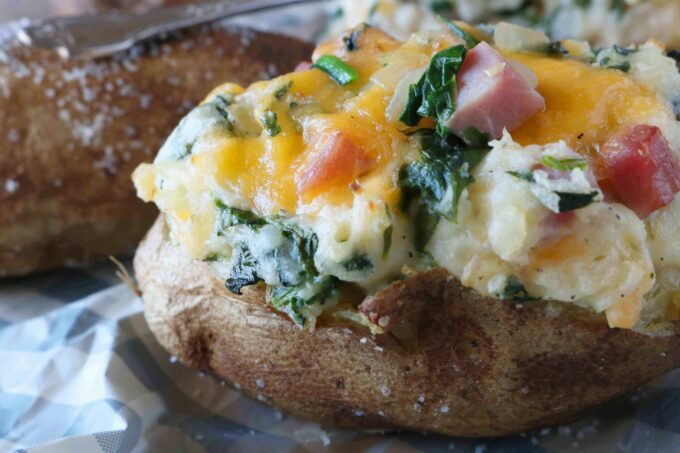 Add ham, cheese and spinach mixture to the bowl, fold to evenly distribute throughout potato base. Scoop mixture back into potatoes and return to the oven for 25 minutes. Remove from the oven, allow to cool slightly, serve and enjoy.